Typical gas-powered lawn mowers produce more air pollution than you likely want to know. But companies like Remington make mowers that don’t produce smelly fumes you have to breathe in and don’t harm the environment, at least as much (they do run on electricity, after all). What’s more, the company produces grass-cutting machines that are still powerful and convenient despite running on cords or batteries. 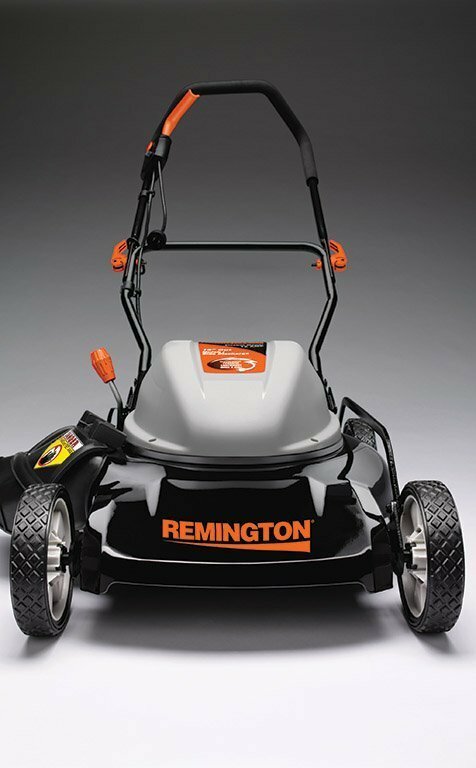 Remington’s RM202A electric-corded push mower is a lean-sized machine that can mulch or send clippings to the side. 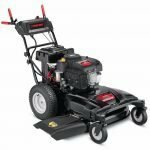 It’s got a 19-inch cutting deck, a 12-amp motor that powers through beastly grass, and it should start right up for you. Not a mower with tons of bells and whistles, but it’s ideal for a yard that’s around one-fourth of an acre and cleans up nicely after riding mowers that can’t fit into tight spaces. The RM202A is easy to start and has a 12-amp mower that can cut formidably sized grass. 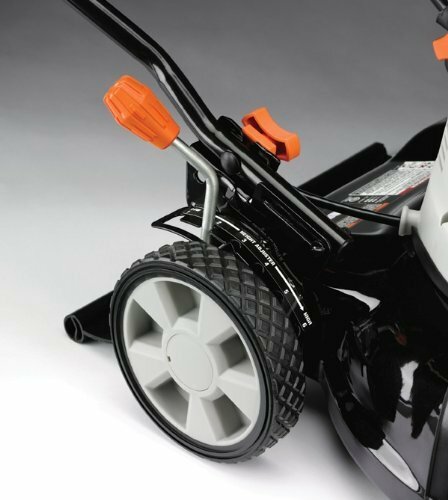 At just 7 inches, the wheels aren’t anything to write home about, but this is still a pretty lightweight, maneuverable mower that gets up close and personal with edges and obstacles to tear down the grass you need torn down. You may want to wait till tall, wet grass dries before using this mower on it–that’s not the type of conditions it was built for. Then again, I’ve talked to folks whose 22-inch gas-powered mowers don’t do so well on such grass. All mowers can potentially get bogged down. Try it out if you want, but wet grass might not be this mower’s friend. But who can argue with a mower that starts with the push of a button, sounds like a loud hum rather than a thunderous roar, doesn’t require gas or cranking, and doesn’t expel nasty fumes into the air? Also, you can’t see the mulched grass that comes out of this mower’s chute, so you’ll never have to look at annoying piles of grass upon each pass. If you can plug an electronic device in, then you should be able to easily run the RM202A. Of course, you’ll need a cord, probably one that’s 100 feet, and you’ll need to learn how to maneuver the mower while handling it. Once you get used to a corded mower, it really becomes second nature, actually comparable to how you might operate a vacuum indoors. Heck, after getting used to a corded mower, some might even say that it’s more convenient to operate than a battery-powered one. There’s also a nice holder on the handle where you can set the cord if you want. Because this mower is on the small side, you can easily assemble it somewhere such as your living room if you want. You basically just raise the handle to where you want it and tighten the screws. I’ll mention again what a joy it is to have one lever that can handle the height adjustment of all four wheels, with the option to choose six cutting heights. The 19-inch cutting deck clears a fairly wide path on every pass, and operators can choose to either mulch or discharge clippings to the side. They’ll be holding a handle that is adjustable and ergonomic. You can find the holding angle that works for you and go to town. Meanwhile, I like the six cutting-height options that can be selected from a single lever near the back right wheel. Though the RM202A cuts yards with a precise touch, keep an eye on those plastic 7-inch wheels, as well as the plastic wheel lock, which has been known to break. Just go easy near debris and tough-surfaced edges that may cause breakage to the wheels if you’re not careful. Note: Although the mulch function works great on this mower, it’s not recommended to use it on wet grass and grass that is more than 4 inches. This mower is lightweight enough that teenagers or those of us on the older side should be able to push it with ease and stop it on a dime with the instant shut-off handle lever. The RM202A is similar to other corded electrics in that it has a start button, a motor/blade control lever (which engages and disengages the motor and blade), and an overload protection switch, all of which make it safe to operate. 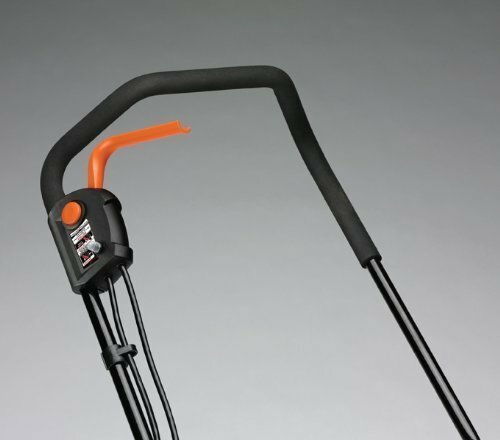 Also, the cord retainer on the lower handle of the mower secures the extension cord and helps it more safely limit its movement. The RM202A is no mere electric toy. 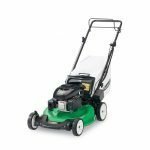 What makes it stand out is its ability to power through tough grass, similar to the grass-cutting performance you get in a gas-powered mower. It mulches clippings beautifully, into oblivion actually, so that you’ll never see them again. It’s got an easily adjustable handle for folks tall and short, and it’ll maneuver in and around obstacles quite well. It’s also easy to start with the push of a button, lightweight for us older folks and teenagers, and it has a 19-inch cutting deck for pretty solid mowing efficiency. It’s certainly a solid mower if you’re considering a corded one. Many people are going to purchase a mower such as the RM202A because of its low-maintenance needs. 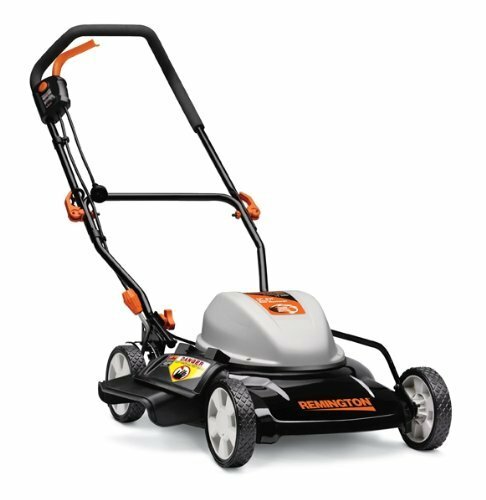 You won’t need to make trips to the gas station, change out the oil, or replace spark plugs, carbs, and air filters using a mower like this one. It’s nice to save money, and those are some ways to do it each mowing season. The options to mulch and discharge clippings works nicely for free fertilizer, and the electricity you’ll use to power this machine shouldn’t break the bank by any means. Overall, the RM202A should save you money and time, and it won’t stress you out with its maintenance needs.